Scrolling through her life on social media, you can see that Sam Saifer Berngard likes to have fun. There’s an energy to Sam that’s so charismatic and captivating, that I wasn’t surprised to hear she brings that same playfulness into her role as mother. While transitioning from corporate work to consulting and now Director of Events + Experiences at Monica + Andy, she also gave birth to two beautiful humans along the way. While juggling an event-filled schedule, I love her thoughts on fear as a mother and finding what works for your family - not anyone else’s. My entire perspective on life changed when I became a mother. All sense of fear for everything in my life not having to do with my children literally disappeared. I gained a clear perspective that as long as my family is safe & healthy, there is no other challenge in this world I cannot face. I felt like I got a backbone when I became a mother. I never used to stand up for myself. Not only do I stand up for myself now, but I stand up for my children and my family. I feel like super woman. My path to becoming a mother was extremely rewarding and I have no regrets. 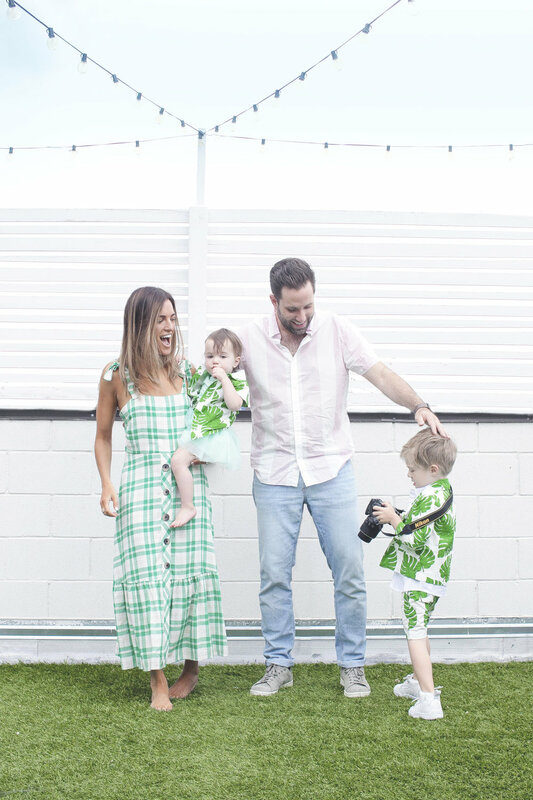 I went to work for myself as a consultant when I started thinking about becoming pregnant and that led me to meet Monica, owner of Monica + Andy. After 5 years (and two babies) of consulting with her, I knew it was the right time to join the company full-time. Working with other moms (& soon-to-be moms) in an environment totally supportive of women is a dream. I couldn’t ask for a more supportive and empowering work environment. My heart aches for women who have hide motherhood from their bosses. I’m taking a 1/2 day tomorrow to go on a field trip with my son, and that is completely acceptable at the company! I’m definitely: Affectionate (my nanny says I love on them too much sometimes - I’m not sure that is possible! ), FUN! (maybe too fun - we literally have 200 costumes in our costume box) and empowering (I want my kids to be whoever they want to be). I’d like to be more strict. It’s something I did not think much about before I had kids and now it’s catching up with me. The importance of really laying down the law from the moment they were born is something I had to learn the hard way. I actually think having a job that challenges me allows me time to myself more than if I was with the kids all day everyday. I can hardly hang up a sweater on a Saturday, but during the week I’m thinking on my own about things other than who drank how many glasses of milk that day. To me, being able to think and be creative is what I need to feel human. I also always make time for exercise. I’ve never been able to handle anything without sweating it out - it’s my therapy. If I have to get up hours before the kids wake up to get it done, I will (and do). We have quite the village. We have a nanny who basically lives with us during the week - my husband travels nearly every week for work, and I have events 1-3 nights a week, whether it’s my own or someone else’s. My family is so, so helpful and important to us. My husband’s family is nearby for the special occasion sleepovers and helping whenever we need. My parents are in St. Louis but would literally drive up in the drop of a hat to spend the weekend with the kids. We are also blessed to have so many best friends who come over all the time to play and dance with our kids. We have so much love that surrounds us, and I feel very lucky. As a woman, I’d like to be more thoughtful. Sometimes I find myself just doing something because I heard it was something I should do or something my kids should be doing. In reality, I’d like to take a pause and think through my decisions more and what makes the most sense for my family. I also want to continue to challenge myself even though it incredibly easy to just remain static. If I can get through a work week with pick up, drop off, and doctors appointments, etc. I feel like an Olympic gold medalist. Sometimes I want to push through and achieve even more. …Perhaps that’s something I also need to work on though (as I am typing this I’m realizing it) - I should probably pat myself on the back more and be proud of how far I have come. Ha!